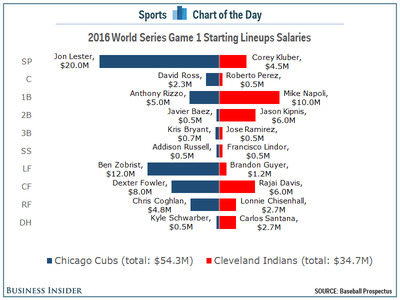 The Chicago Cubs and the Cleveland Indians will face off in Game 1 of the World Series on Tuesday and while there is a huge disparity in how much each team spends on payroll, that gap will be much closer with the players that will be on the field to start the game. According to Spotrac, the Cubs had a payroll of $186.4 million this season, fifth among all MLB teams. Meanwhile, the Indians were the lone playoff team not among the top 14 payrolls this season, with a $114.7 million payroll that ranked 22nd. But when the teams take the field in Game 1, only a fraction of those payrolls will be on display, thanks to other pitchers, players on the bench, and other players not on the active World Series roster. The Cubs starting lineup made a combined $54.3 million this season, with $20.0 million of that going to starting pitcher Jon Lester. 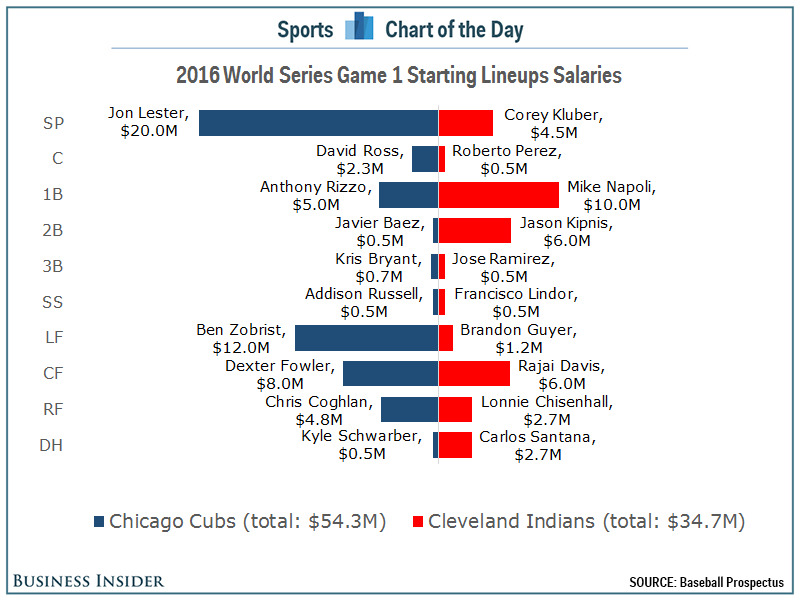 The Indians lineup combined to make $34.7 million, with $10.0 million of that going to first baseman Mike Napoli.